Star Air will be the newest airline in India’s domestic airlines industry. I was tracking Star Air for over an year now- they had their website up n partially running and feelers of starting operations at any time soon, all through 2018. Now the website is updated with flight schedule, fares and ready for booking. A few seats are already sold as well. Sanjay Ghodawat ‘s Star Air group gets a code “OG”. I guess they wanted SA but that was taken already. Star Air is offering a combined model of LCC + Full Service- there is a low cost “Star Regular” fare which gets you only flight & 15 Kg baggage-seat selection, food would cost extra, whereas a slightly expensive Star Comfort package includes Meals, seat selection and Priority baggage. There is a 3rd Star Flexi option which entitles you to change travel dates by paying only fare difference. At present, Star Air pricing is 2x the bus fare for half the time. Bengaluru-Hubli KSRTC AC bus ticket costs about 800 INR and takes 7-8 hours. 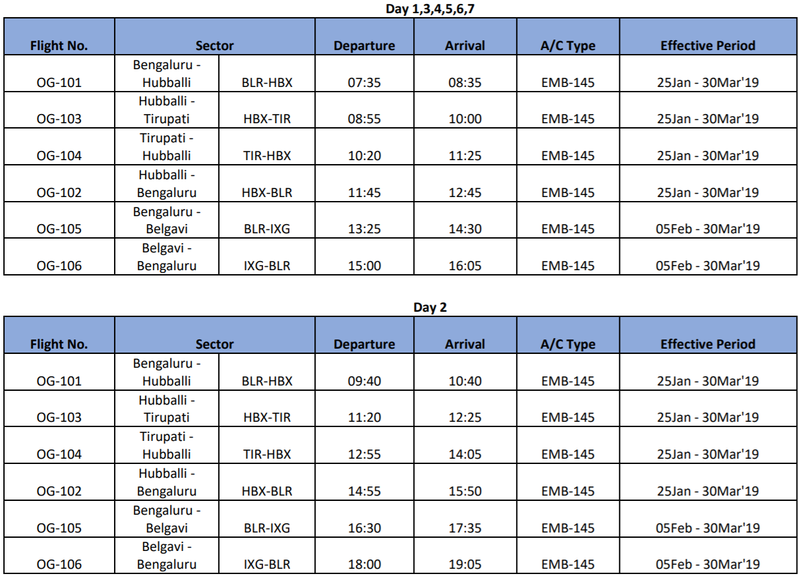 Bengaluru-Hubli star air flight ticket can be had for Rs 1299+225 convenience fee= Rs 1524. Add some cost to reach Bengaluru airport and for about 2000 Rs you can fly to Hubli, saving 8 hour road journey. Spicejet, Indigo, Air India already fly between Hubli and Bengaluru and Star Air will compete with them. But Hubli-Tirupati route is unique- there’s no competition at all. Star Air earlier had New Delhi as one of their possible destinations-that is removed for now as the aircraft will keep shuttling between Bengaluru-Hubli-Tirupati-Hubli-Bengaluru-Belagavi-Bengaluru. Seat selection costs Rs 300 for standard seats, 600 for emergency row and first row extra leg room seats. You can have your bag out on priority for extra 50 bucks. A 225 Rs convenience fee will be charged per flight. At present bookings are only being accepted between 25th Jan and 30th March. Star Air also seem to have rolled out a Loyalty program for their passengers.